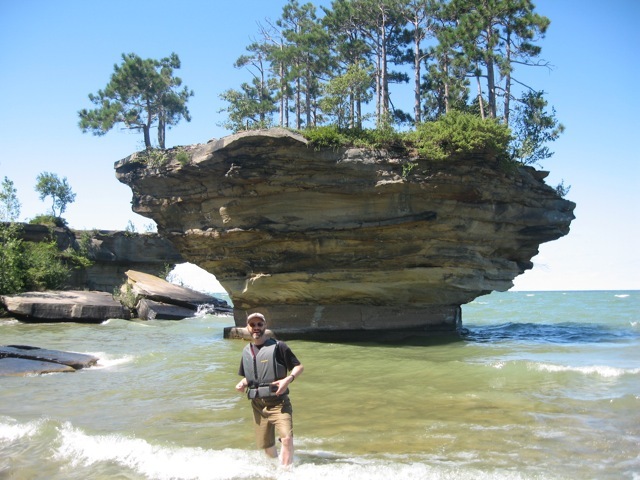 After seeing a picture of Turnip Rock on the Internet last year, and discovering that it was in Michigan, I decided that we had to go see it in person. 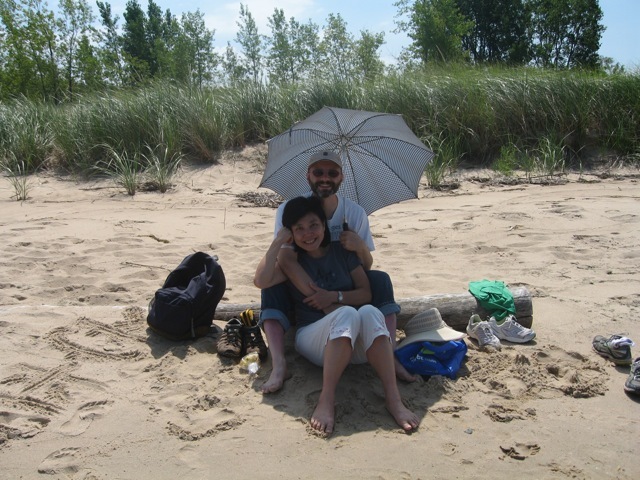 We drove to Port Austin, which is on the very tip of Michigan’s thumb. We stayed the night in a local hotel, then the next morning, we rented kayaks and started our 2-hour paddle to the rock. We stopped on a small island to rest and have lunch. Lunch was MREs (“meals ready-to-eat”), which were developed for use by the military. They’re actually not bad-tasting, and very convenient for outdoor activities. The north part of the thumb is surrounded by Lake Huron. 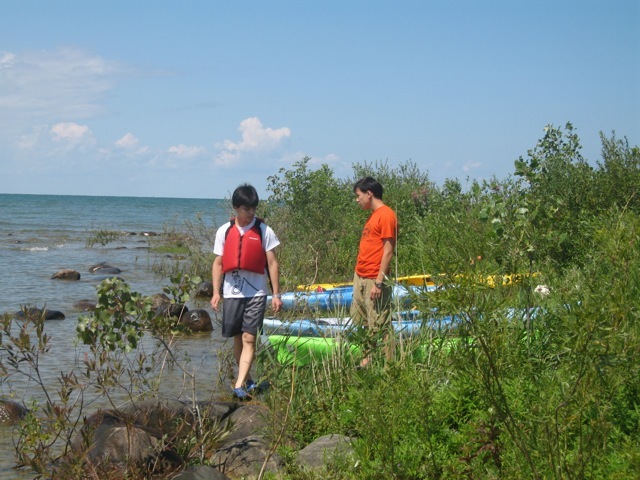 The shore is rugged and rocky, and reminded us of Lake Superior in the UP. 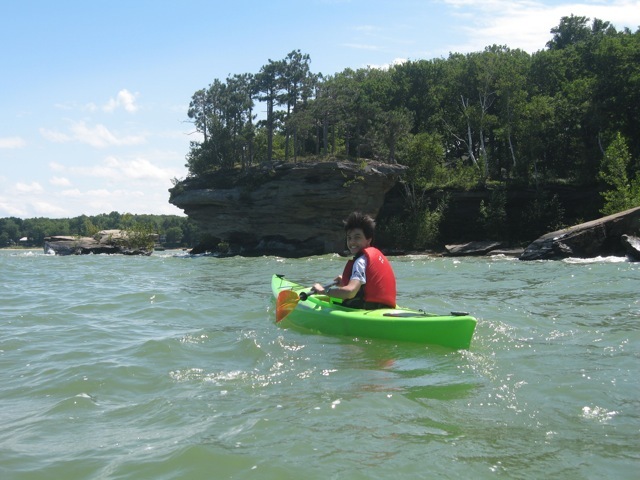 Evan is a fearless kayaker (is that a word? My spellchecker seems to think not. But you know what I mean). Stacy is more cautious. As we neared our destination, the wind and waves picked up quite a bit. Although I never was worried about getting capsized, we got splashed by several whitecap waves. Lucky for us, the sun was shining, and the water wasn’t cold. We had some serious trouble landing near the rock. 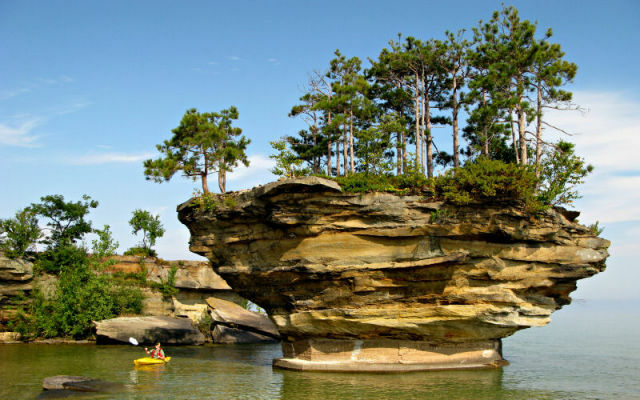 Stacy was carried past the rock, and was pushed up against the rocky ledge at water’s edge. 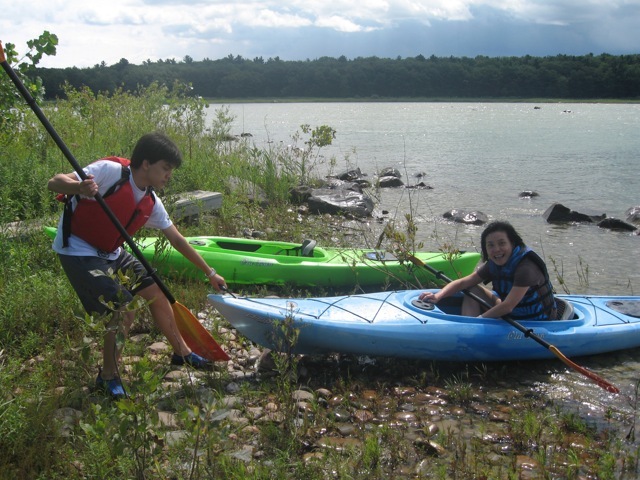 Evan stopped to help her land, but waves moved his kayak too close to shore, and it got flooded. It took three of us to get it out of the water and drained. Stacy was spooked, and needed a minute to catch her breath. Here’s a picture of me in front of the rock. You can see how rough the water is. 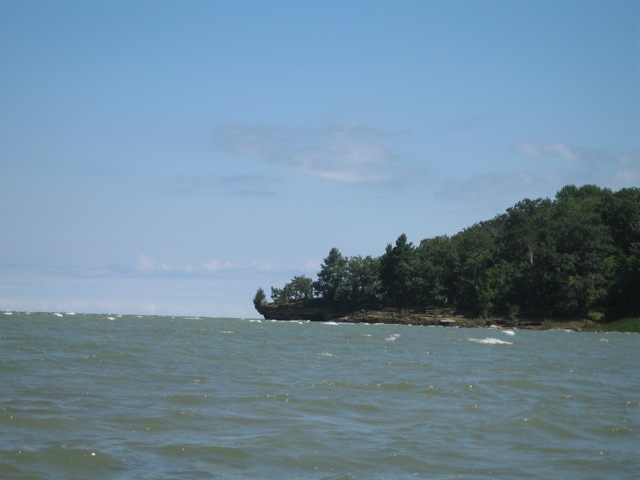 Compare the water in this picture with this picture from another visitor’s blog. You can see the size of the waves that we had to contend with. The trip back was uneventful. We had a nice dinner in town to celebrate being alive. The next day we went to the beach to enjoy the sun and water. I highly recommend the trip to experienced kayakers, but watch the weather. Don’t go out if the waves are too high!